If you know that you will be unable to attend a class or two, simply subtract $10 from the $80 for each class. Lorraine has been an active yoga instructor for 15 years, certified at Kripalu Center for Yoga and Health in Lenox, Massachusetts. Lorraine specializes in yoga for health, healing and restoration. She has completed intensive courses in Asana, Pranyama, Assisting and Restorative yoga. Lorraine has taught classes at Berkshire Nautilus, and private classes in homes and studios across the country. She volunteers to teach yoga classes at the Berkshire County Community Correction Center and holds open classes in Dalton and Lanesboro. followed by a series of warm-ups and yoga postures (asana). yogic breathing and a general sense of well-being. including guided imagery. Program can easily be modified to meet individual needs. In addition to her schedule of yoga classes Lorraine is also available to teach private classes in Hatha or Restorative Yoga. 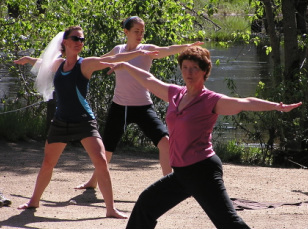 She has had the honor of teaching yoga classes to the wedding party and guests on the "wedding morning". "Lorraine's yoga class on the morning of my wedding was really special - it brought all our guests together in an active, fun and relaxed way, and set the stage for the whole day"